One of the things Steph really wanted to do on our trip through South East Asia was to stay at a bungalow that overlooked the beach. We had heard of some places in Cambodia were a must visit, but were somewhat off the beaten track. Steph managed to hear about Sok San beach. Little did we know that this was also the place where they filmed some of the ‘Survivor’ series and ‘Temptation Island’. There are two ways to see this amazing beach. The first is to take a boat that will take you around the island to the other port in Sok San village. This is approximately a one hour journey. 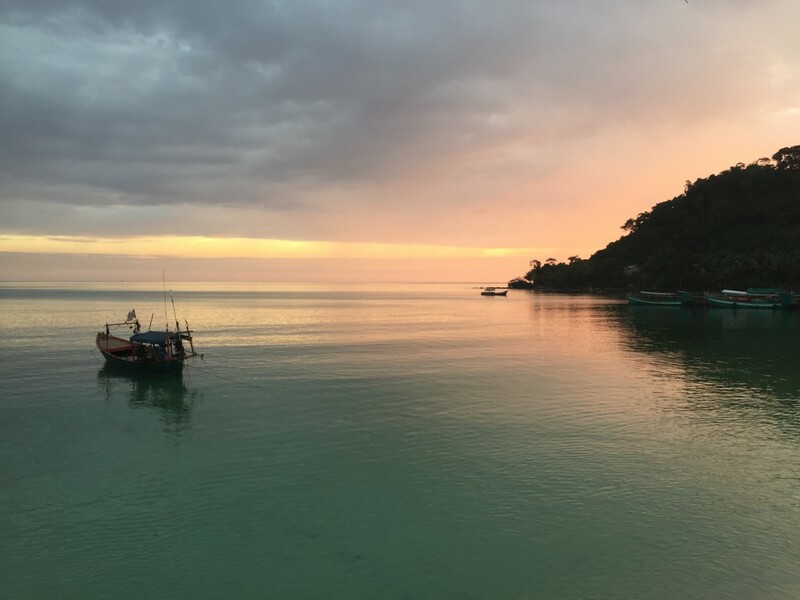 Alternatively, you can take a hike up the mountain, through the jungle and trek across the 6km of white sand that Sok San beach has to offer until you reach the beach bungalow. 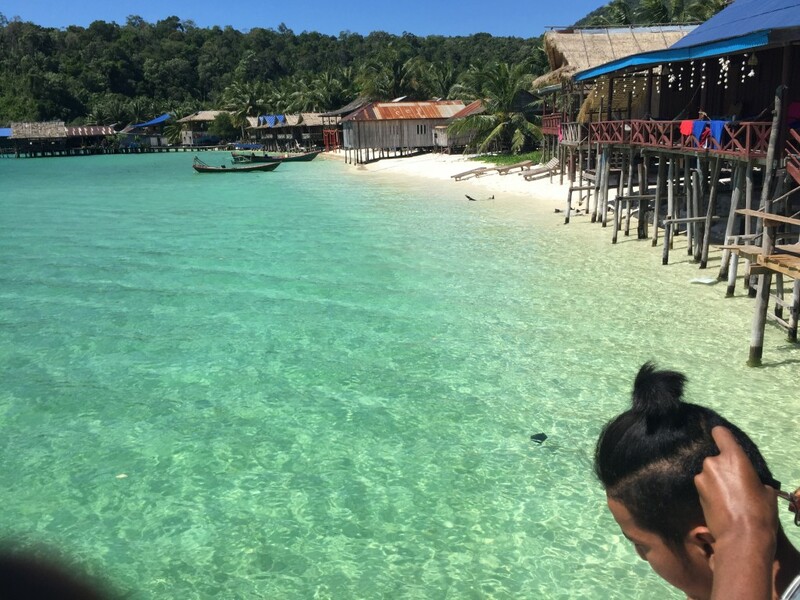 The Sok San New Beach bungalow is situated in the main part of the village, perched upon fixtures that allow you to step out onto your balcony to clear blue waters, the mountain on the right hand side, the pier and the sounds of people and children playing and fishing throughout the day. The place is more tranquil and is suited to couples that want to spend some time away. The price of the bungalow was cheap with us securing an Agoda price of £16 per night. Food was limited to purchasing it from the bungalows. There aren’t a huge selection of restaurants or supermarkets to buy food. Depending on what you bought, it could be reasonably priced or more expensive. (For some reason, Western food was ridiculously priced with an English breakfast costing $15) The staff that run the place are the children of the owners that live in town. They do their best given that they haven’t really had any formal training in the hospitality and hotel tourism trade. Some of the food provided was nice. Unfortunately, Steph did get a bit sick from food poisoning. But we noticed that throughout the trip in Cambodia. As for the bedding and the accommodation, you get what you pay for. The bedding was somewhat manageable, however there were bed bugs in the mattress that left me with bite marks on my skin. Also, electricity runs on the island for a few hours per day, so you need to do what you can by the early morning or before 10pm in the evening, otherwise you will need to rely on candles and torches. This place is unique and offers a nice getaway, depending on what you are after. It is nice to have a beach on your doorstep. Although there are sandflies in the water that make it unpleasant to swim in for a long amount of time. But if you were keen on a place that looks like paradise, then this is definitely an option that you can get on a budget! We’re heading to these bungalows in a few days and are really looking forward to it. It looks and sounds great, though not to keen on dealing with the bed bugs as we’re having to fight off a few bed bugs in our Phnom Penh hotel right now. Any other tips for our stay? Hi Ryan. Thanks for your comment. I’ll be honest about the place. The beach looks amazing. Just beware that there are sandflies on the beach and in the water. So it is a magical place to experience, but you will experience biting on the water. Make sure you carry repellent to deter them from you. Where we stayed there were bed bugs. I had to wear long sleeves and long pants when sleeping as I just kept on waking up to several bites, despite having the mosquito net. Just make sure you wrap up well. Check out the beds before you book a place and try to avoid sleeping on the mattress itself. Always request newly washed sheets when you can or take your own. If you can afford to stay in a more upmarket place, then do so if you don’t want the bed bugs. It is a nice experience when you get there. Also make sure the place you stay offers you everything that you request such as Wi-fi and electrical power. There was only power on the island for a few hours a day and wi-fi was scarce. Other than that, I think you will have a fantastic time. Try the lime fish. That was my favourite dish while I was there. I booked 3 nights and paid the higher price for beach front. When we arrived we were told it was fully booked and the only rooms were over 100 meters from the beach. They did not refund us or even pay us the difference in price (We got 2 rooms beach front for $20/night but were given $10/night non beach front rooms, so they should have refunded us $60). Service on top of that was terrible. Took 83 minutes to serve food and one of the dishes was never served (I timed them as I was super upset). BEWARE AND AVOID. There are many better and more honest bungalows on the same beach.